[Jan] noted that they’ve come up with an interesting, low cost method of 3d scanning over (Update: http://www.david-laserscanner.com/wiki) at the Institute for Robotics and Process Control. 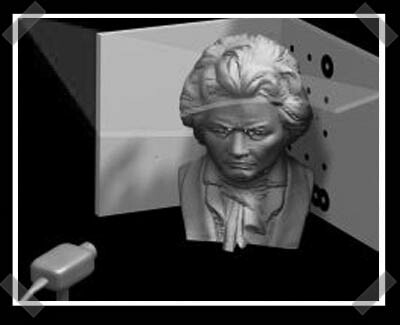 Once the software is calibrated with the preset background image, a laser line is run over the object (Just think about every sci-fi laser scanner you’ve ever seen) The software appears to measure the contour of the object by the breaks in the line as it’s passed over the object. Once a mesh of measurements is taken, the object can be reconstructed in the software. According to [Jan] “With Their technique they won the Main Prize of the “work group for Pattern recognition” this Year in Berlin.” Now, make it work under something besides windows and .NET. Get your Design Challenge entries in! The 25th is rolling up on us quick! This is interesting, just a shame I took my laser level to bits. Great, I now have a use for my JML laser level. It’s totally useless for its intended purpose, but it will be perfect for this. In fact it looks identical to the one in the documentation. So this will not work with an ordinary “laser pen” ? cool, i’v always been intrested in 3d scaning but becouse off the cost i never realy did anything with it now all i need is a lazer. Maby i will make some automated version off this (maby mount a lazer on top off a webcam or something). Interesting, me and a friend did a similar project a few years back for a computer vision class. That one used two cameras though. If you have a laser pen and want to create a laser line you can do that quite easily by putting a cylindrical glass object in front of it. (Test it with the foot of a wine glass or something similar.) A cheap source for that is drink stirrers in clear plastic. well, the software looks like it only requires .net 1.1, so it might run under mono. lol, we had a similar project in the german “youth’s researching” in 2004, which won the first price in the under-18 category. Will seemed to suggest that there was something wrong with .NET…? In any case it’ll probably work with Mono. This is one of the coolest hacks I’ve ever seen. So easy…anyone could do it with 30 bucks. Only problem I ran into was the “Strait Line Laser Level 120” that I used wasn’t quite bright enough to show accross the background. It would always give me “Left side not bright enough” or a similar error. A university that publishes a project with no source code? What is the purpose if I cannot see how it was implemented? Hey this works. Went through 3 laser levels before I got it to do its thing. The laser has to be BRIGHT! Ironically enough, the first thing I scanned was my wacom pen..:P The software doesnt allow for “stitching” various views together to create a complete 3d model but a cheap and efficient 3d scanner none the less…congrats! what kind of output is the image? can it be utilized imiediatly in autocad or solidworks or pro-e? is a conversion needed? I went out last night and bought a laser line level to do this. It does work and if you play with it for about an hour it works damn good. We made a giant calibration area in the corner of a room and did full body scans. Close up face scars come out eerily good sometimes, it all depends on your incidence angle of the laser. With some fine tuning this stuff could be useful, especially for reference modeling. no source code? wuuuuuuuuuuuuuut? u r crazy or smth?